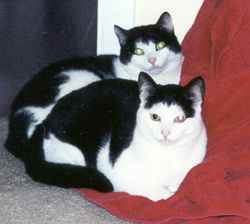 Harley (back) and Patches (front) were adopted in August 1996 by Monica, who tells us, "Harley is a very mellow cat. All he does is eat and sleep. Patches is quite active and she loves to cuddle up in bed with us! Harley can be quite affectionate too, when he wants to." 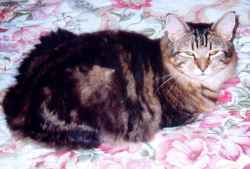 Here is a picture of Herbie, who was adopted by Beth and Cass in March 27th, 1999. 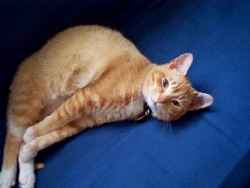 They write, "Although Herbie has only been in his new home for a short time, it only took him a couple of days to stop 'hiding' from us, and really come into his own. He knows his place now and that is here with us. He is a love and a joy and true to his name - a love bug. "Your organization provides a life saving service for kitties that can't always 'speak' for themselves and we thank you." Timberwind was adopted in January 1999, when he was a year and a half old, by Jenn, who wrote us, "When I saw him on your website I fell in love with him! It took some time for Timberwind to feel comfortable, but he has come a long way!!! I can pick him up and he sleeps with me.... he also loves his brother Simba and Simba loves him too! They pal around, play and even take naps with each other. Timberwind loves attention and he will let you know when your not giving it to him!!! 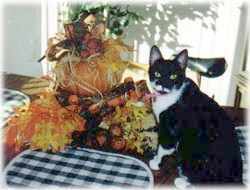 Timberwind has a great personality, I am so happy I found him on your website..."
Peggy adopted Mel in September 1998; his name was "Stash" at the time and it was estimated that he was two months old. He's now named "Mel" because of his mellow personality. When first arriving in his new home, he promptly plunked himself down, rolled over on his side, and took a nap. He's been like that ever since.